After much hard work by the steering group and others, £EITH CHOOSES 2018-19 is open to applications. The closing date for applications is 21 January 2019. Your project might address both of these themes, but you will need to choose one when applying for £EITH CHOOSES funds. Anyway, get cracking on your applications! 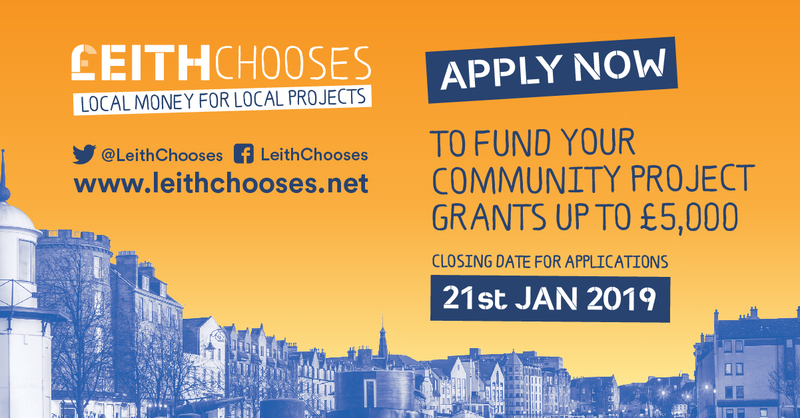 Application forms, guidance notes and an explanation of the voting process are available from the Leith Neighbourhood Partnership website. In-person guidance on making applications will be available. The first of these is on 11 December, and there will be two more in January. Check the £EITH CHOOSES website and/or Facebook for details. *The Leith Neighbourhood Partnership area is roughly the same as that of the three Leith community council areas: Leith Central, Leith Harbour & Newhaven, Leith Links. Check my web-map of Edinburgh community councils for where these CCs cover. This entry was posted in community councils and tagged £EITH CHOOSES, participatory budgeting by Bruce Ryan. Bookmark the permalink. My personal side has blogged about £EITH CHOOSES participatory budgeting.